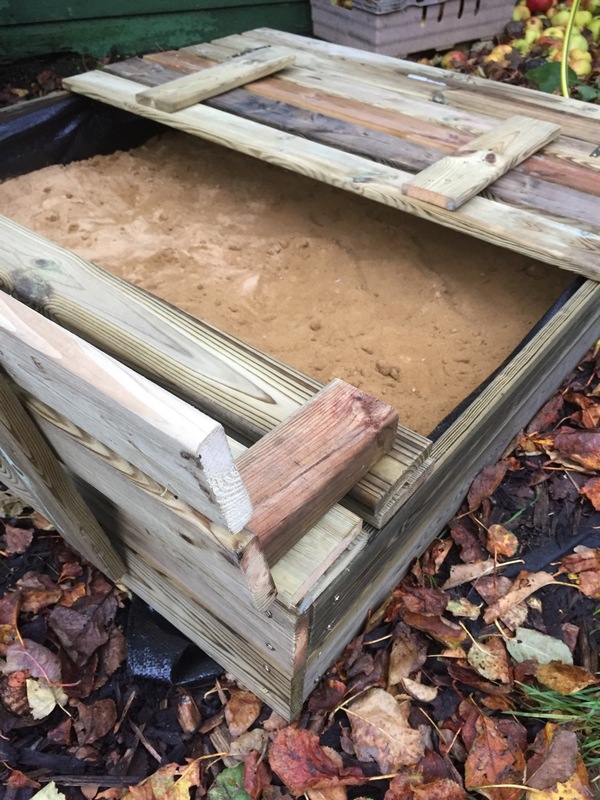 …the sand pit lids fold back to create benches on either side, so the children can sit on the side of the sand pit and play with their toys. We are so excited to put our wellies on and get out in the sand pit tomorrow after school. It’s the perfect size for my two. It took around two hours to build, once we realised we needed the drill to get the screws in quicker and sturdier. The instructions are quite clear on how to build the sand pit, we did have to sit and think for a moment as to what bits went where. Initially we got it a little wrong and had to take some screws out and start again. Once the main structure was in place the top bit was relatively easy. It was great to see the lid and bench coming together. The instructions didn’t explain what to do with the black lining that was included, I assumed it was part of the sand pit base, so I screwed it around the inside edges of the sand pit to secure it. This will keep the sand in the pit securely and some of those bugs out too! The wood is extreme weatherproof, so with a little care and attention over the Autumn/Winter months, it should stay in use until next Summer. The next stage was to get the sand pit in the garden, it’s new home. Fill it with sand and watch the children play with it and their toys. Diggers, dinosaurs and little ponies will be playing in it when the weather is not raining. Wickey sent us the Flippey Sand Pit 120 x 125cm, it is currently on offer for £63.95. It is really large and the perfect size for two little ones to play comfortably together. I love hearts! Do you? What's the Obsession with Contemporary Furniture?